When you think ‘gaming mice’ you might not necessarily be thinking about Microsoft, but some of our slightly older readers will immediately get hit by a splash of nostalgia upon reading this title. Back in the early 2000’s, when the gaming industry wasn’t the multi-billion behemoth it is now, these Microsoft mice used to be seen in almost every household, and for good reason. 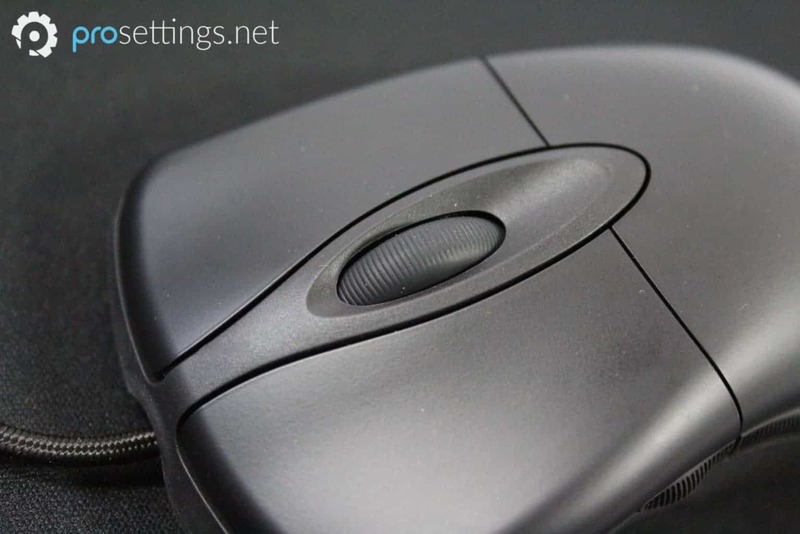 The Intellimouse not only offered a great and responsive sensor in a time where trackballs were ubiquitous in computer mice, but it also offered two side buttons, a great ergonomic shape, responsive buttons and a scroll wheel. These things might sound like the most standard thing in the world in 2019, but they were very much new and innovative at the time. In a way the Intellimouse is the grandfather of all modern (gaming) mice, and that is something that you have to respect. This mouse has achieved a legendary status, and while some of our readers are probably too young to have ever seen one in the wild there is no denying that the Intellimouse deserves its place in the gaming hall of fame. 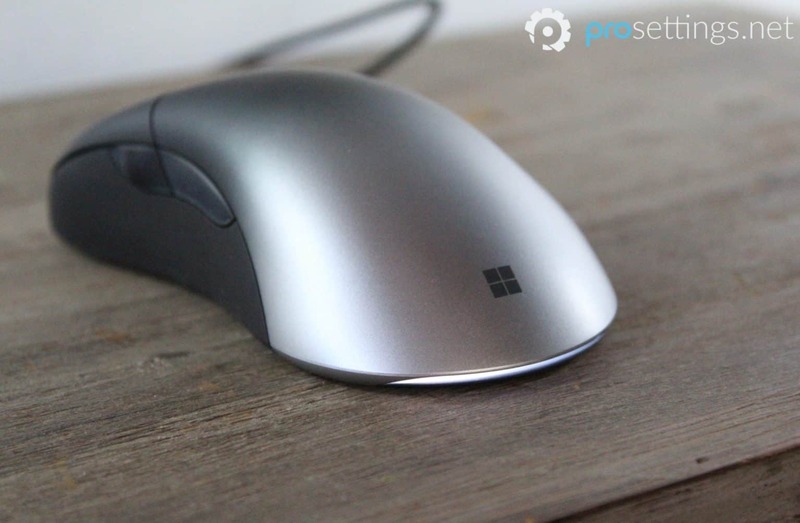 Recently, Microsoft released a revamp of this legendary mouse in the form of the Intellimouse Pro. The modern version of this iconic mouse features updated internals, such as a Pixart 3389 sensor and Omron switches. Can the grandfather of computer mice still roll with the new kids, or is it time to let the new generation take the reins? Read on to find out. The first thing I got when I opened the package was a flashback to high school, but if you’re younger than me you probably won’t be ‘wowed’ too much by the Intellimouse Pro. That’s not a bad thing though: I don’t really like overly gaudy or aggressive aesthetics and the Intellimouse Pro is one of the sleekest looking mice I’ve reviewed so far. The device is black towards the front and fades into a classy silver. A tiny Microsoft logo adorns the backside of the mouse and the iconic red ‘taillight’ of the older Intellimouse models has now been replaced by a sleek and subtle (configurable) RGB strip. All in all it’s a very classic looking mouse, which absolutely fits the heritage of this line of rodents. The Intellimouse is a medium to large sized mouse, coming in at right around 100 grams on my scale. It’s got a very nice ergonomic shape to it which isn’t so aggressive that it forces your fingers into certain grooves, so I can see this working for a wide variety of grip types. A notable omission from the design of this mouse is the DPI button. I myself don’t ever use that since I’m always on 1600, gaming or not, but I can see this being a bit of a problem for people who like to switch their DPI on the fly. The unboxing experience with the Intellimouse Pro is one of the most basic ones I’ve encountered so far. I don’t mind that since I really don’t care about fancy packaging and the likes, but since there is a packaging section on every mouse review I’ll briefly go over it. Inside the box you’ll find the mouse and the usual documentation, and that’s it. 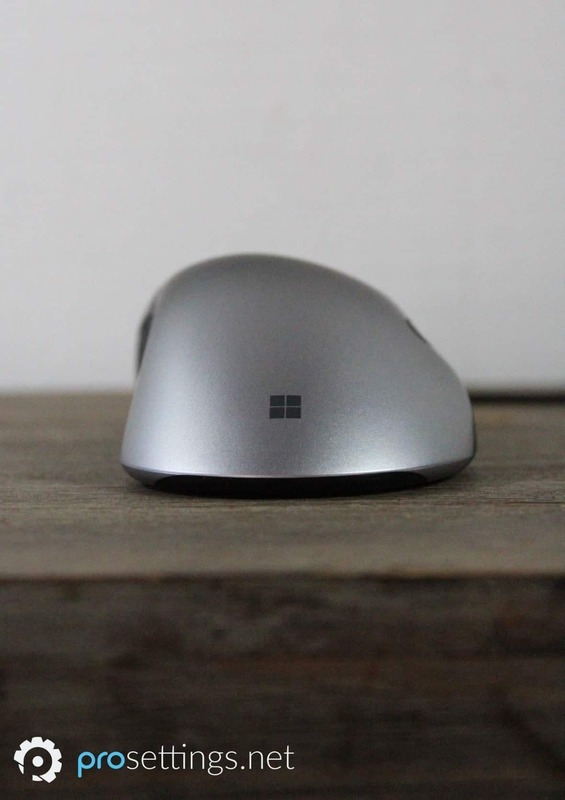 One of the factors that’s made the Intellimouse such a loved design is the shape of it. 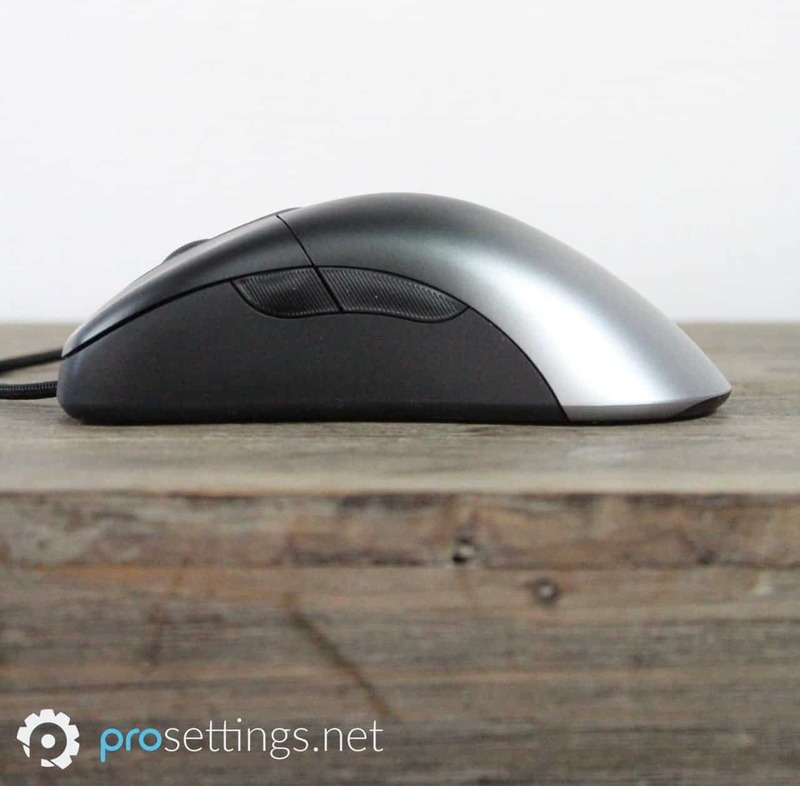 It’s an ergonomic mouse with a rather safe shape: there are no weird bumps, grooves, or other design elements that force you to hold the mouse in a certain way. If you’re into ergonomic mice and your hands aren’t too small then it’s going to be extremely hard to dislike anything about the shape of this mouse. 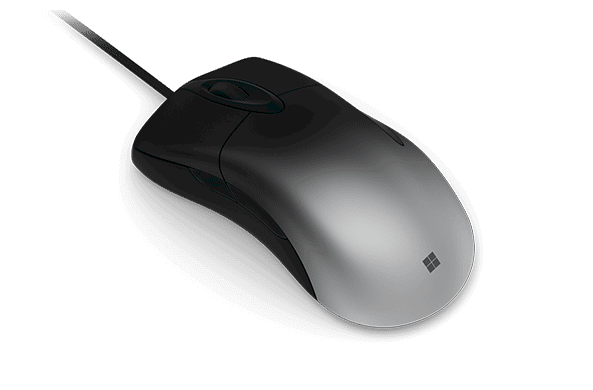 The Intellimouse Pro is coated with a sort of blend between glossy and matte which is super grippy for all but the driest of hands, but it does catch oils and sweat rather easily, meaning that you’ll be cleaning the surface of the mouse a bit more often than you’d like to if you want to keep a completely clean mouse. The sides feature a rubberized material which definitely helps with picking up the mouse and moving it around. One thing that I have a slight issue with are the side buttons. They’re fantastic when it comes to the clicking action and feedback, but by design they sort of blend into each other which can make it hard to differentiate between the two when you’re in the heat of the moment. The frontmost button does have a little bump to it to help identify it a bit easier, but it’s still something that I found rather hard to adjust to during my testing. As mentioned before there is no DPI button on the mouse. You can bind the side buttons to change DPI in Microsoft’s Mouse and Keyboard Center software, but most gamers I know use these buttons ingame as well, so that’s not really an option. I personally don’t mind not having a DPI button, but this could be a deal breaker for people who use this button often. There’s four small mouse feet on the bottom of the mouse which provide a pretty fast and smooth glide with almost no wear in time at all. The Intellimouse Pro has Omron switches underneath the buttons, and they do the job just fine, as is par for the course for Omrons. I personally don’t like extremely light buttons, since those can cause accidental clicks and those can be fatal when you’re flanking or anything like that, and the clicks on the Intellimouse Pro definitely aren’t too heavy. Microsoft has achieved a nice balance between light and heavy for these buttons when it comes the the necessary actuation force, and that really works nicely for me personally. Both buttons feel fine to click as well: they don’t provide the most amazing and crisp feedback or anything of the sorts, but they’re not bad either. The same goes for the scroll wheel; it’s perhaps a bit small, but it’s plenty grippy due to the rubberized texture on the wheel and the tiny grip ribs it’s finished with. The steps are clearly defined, and clicking the mouse wheel doesn’t feel hard at all and results in a crisp and snappy click. The only downside to this wheel is the fact that it sometimes feels a bit ‘loose’ and flimsy between steps, which can result in accidentally scrolling a step too far, so be wary if you use your wheel for precise operations such as switching weapons and so on. The side buttons are almost perfect, however. I personally had a rather hard time adjusting to their shape and size, but there’s no arguing that they feel great to press and use. There’s a clear feedback and pleasant clicking sensation, and there’s almost no travel time on the side buttons. Great implementation there, though I still wish they’d made them a bit more distinguishable. 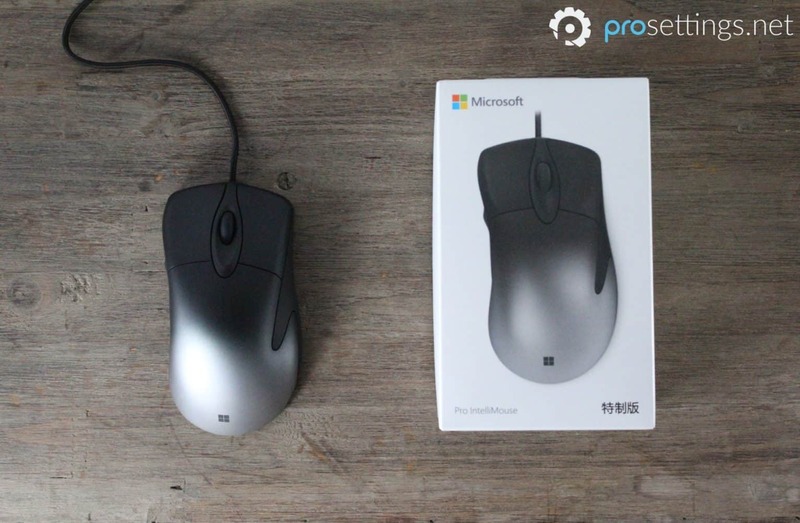 It’s pretty safe to say that Microsoft has at least some experience when it comes to making peripherals and PC related products, so as expected the build quality of the Intellimouse Pro is absolutely aces. The mouse doesn’t make any unwanted noises, not even squeaking when I’m pressing down on its sides with all my might. I always bang mice against the desk a bit during testing (nothing extreme, obviously, but I believe a well-built gaming mouse should be able to stand up to aggressive swipes and some mild ‘angry bashing’) and that gave absolutely no issues either. The cable is pretty thick, and braided. It’s not the stiffest or worst cable I’ve ever used, but this can definitely be improved on in the future. Braided cables might give a product a more premium look, but as far as gaming gear is concerned you shouldn’t be concerned about looks at all. The cable is certainly manageable with a mouse bungee, but I would have loved to see this be a bit more flexible. Microsoft has slapped their own version of Pixart’s 3389 sensor in the newest Intellimouse, and as we all expect from the latest Pixart sensors it performs flawlessly. There is absolutely no jittering, angle snapping, smoothing, or other absolute gaming mouse sins, so the Intellimouse Pro is going to track your movements absolutely flawlessly. These ‘new’ flawless sensors have been out for a while now, so you can reasonably expect every new mouse from reputable brands to feature a perfect sensor, though that obviously doesn’t mean nothing can go wrong with the implementation. Microsoft got it right though, so no need to worry about your hardware holding you back with this one. The mouse is configurable in Microsoft’s ‘Mouse and Keyboard Center’ software, where you can change the DPI, tail light color, polling rate, and so on. It’s a pleasantly lightweight and straightforward piece of software which also gives you the option to create macros for the side buttons and the middle click button. 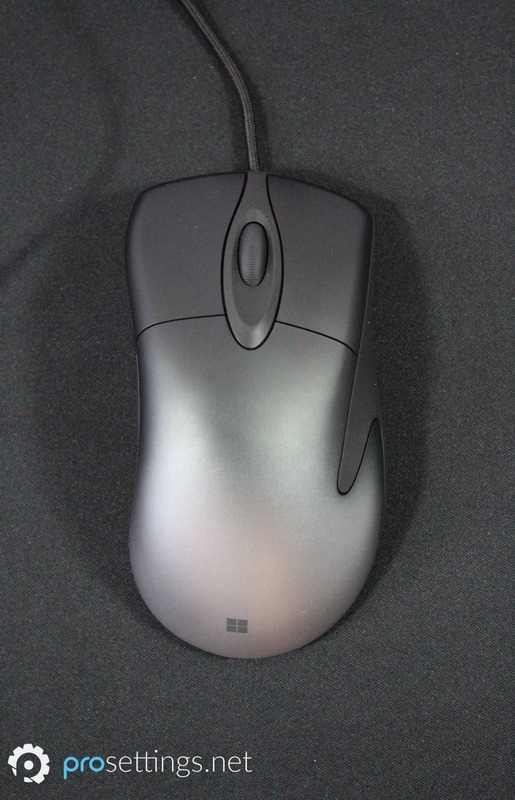 The Intellimouse Pro is a medium to large sized mouse, so smaller hands should steer clear. It’s got a very safe shape so it should accommodate most grip types, but do be wary if you’re a fingertip gripper or you like to hold your mice towards the back. The main buttons on the mouse seem kind of small in comparison to most other gaming mice, so you’ll want to make sure you can comfortable reach these buttons when you’re out there gaming. So it’s recommended to make sure that your hand is actually large enough for this mouse, but if it is it’s honestly one of the most comfortable ergonomic shapes out there. It’s very reminiscent of the EC series (or rather the other way around since the Intellimouse obviously came first) so if you like these sorts of shapes you’ll love this one. The birth of the Intellimouse was also the birth of gaming mice as we know them, and the newest iteration of this absolutely legendary mouse shows it can still roll with the big boys. 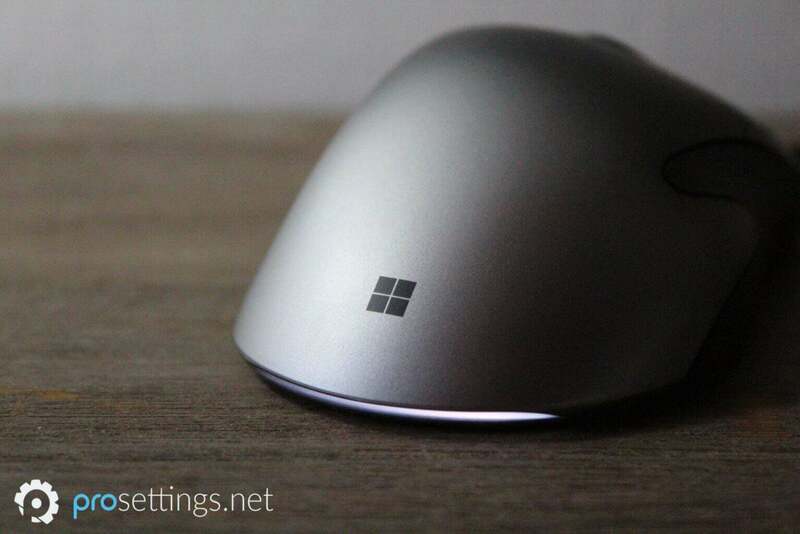 Featuring a flawless sensor and the legendary Intellimouse shape, the recent rebirth of Microsoft’s iconic mouse will come as a welcome surprise to older gamers, but the younger generation will also find plenty of things to like. The cable can definitely do with some improvement and the weight could be reduced, and some aspects (buttons, coating) aren’t exactly going to shock the world, but that doesn’t mean it’s not a really good gaming mouse in its own right. Definitely look out for this if you like ergonomic mice and/or have larger hands. Or if you just want to game with a piece of gaming history. It’s sort of a tossup to me. 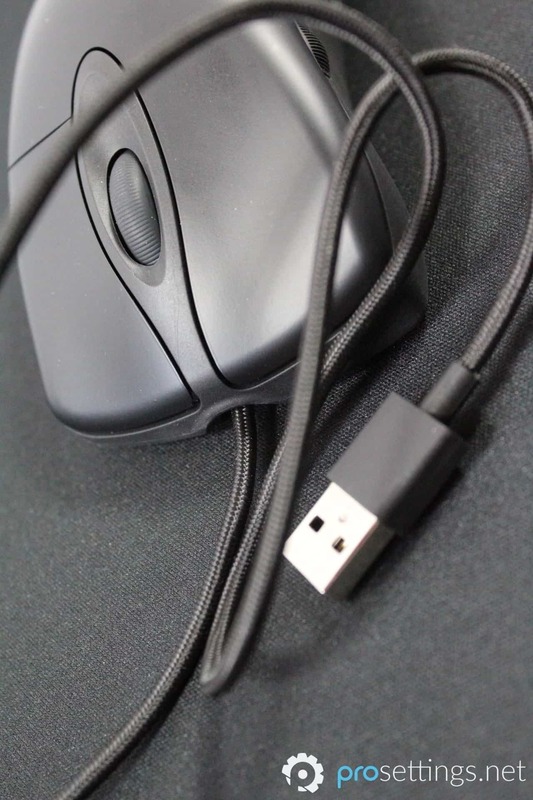 For example I like the scrollwheel on the Intellimouse a bit better, as well as the side buttons, but the cable of the EC2-A/B is better and I also slightly prefer the smaller feeling shape. I’d be happy using either and both have clear strengths and weaknesses, but if I had to choose one it’d be the EC series, though it would be very close. Where do you order this mouse? I think it’s an exclusive to the Asian markets right now, but I don’t see any reason why MS wouldn’t expand it to other regions so unless you want to import it’s probably best to wait it out. I’ve tried over 15 different mice and this is definitely my end game. I got it around a month ago and fell in love instantly. It’s quite a big mouse, be warned, if you have smaller hands you might have trouble. For reference, I have 19x9cm hands and use a fingertip grip. It’s currently only sold in China/Taiwan, nobody knows if they plan to release it in America. Yeah it’s definitely a great mouse. There’s a reason it’s got such a legendary status! Glad you’ve found your endgame. It’s the #1 used mouse in Overwatch League. A Logitech G Pro Wireless review is coming soon. Stay tuned. any plan to review the logitech g mx518? the other big retro mouse revival? it use the same sensor as the g pro but with way lover price. We’ll try to review it soon since there’s definitely interest for it. Thanks for the suggestion! I got this mouse after I have read your helpful review. It is certainly one of the very best mouse in the market right now, state-of-the-art sensor with enough RGB light. I used it for Rainbow Six and CSGO, the shape really helps my spray! More than that, it is cheaper than the Zowie’s which makes it more competitive. Hey, thanks! Glad you like the review and found a mouse that you love!